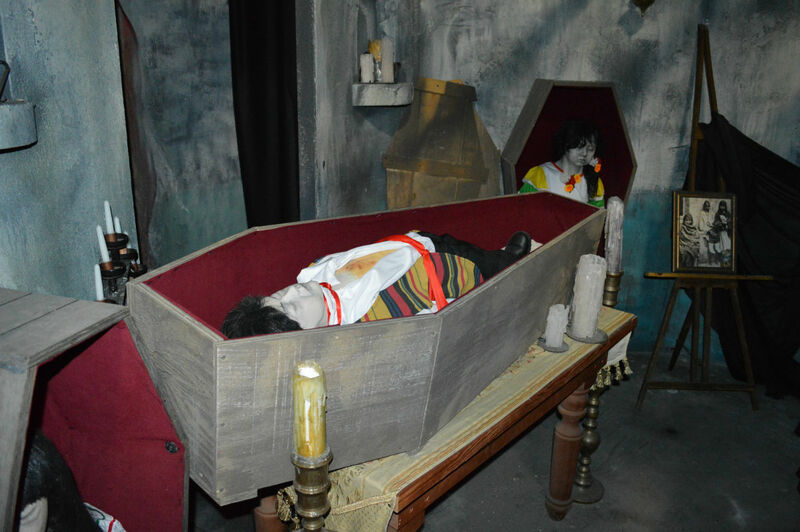 As a big fan of Universal’s Halloween Horror Nights event, I knew after going in 2012 that I wanted to take a lights on tour of the houses as part of the Unmasking the Horror VIP tours. This year Universal broke up their tours into two sessions. The Morning Menace tour started at 10:30AM while the Afternoon Abominations tour started at 2:00PM. Each tour cost $59.99 per person-per tour, or $99.99 if you did both tours. Myself, Brandon Glover from the Universal NOW! podcast, and friend of the show Zeus Navarro signed up for both sessions. To start the day we were directed to check in “promptly” at 10:00AM at the VIP check in lobby located next to the guest services windows at the front of Universal Studios Florida (USF). We were checking out the Royal Pacific Resort that morning and ended up running a little late, arriving at about 10:20. 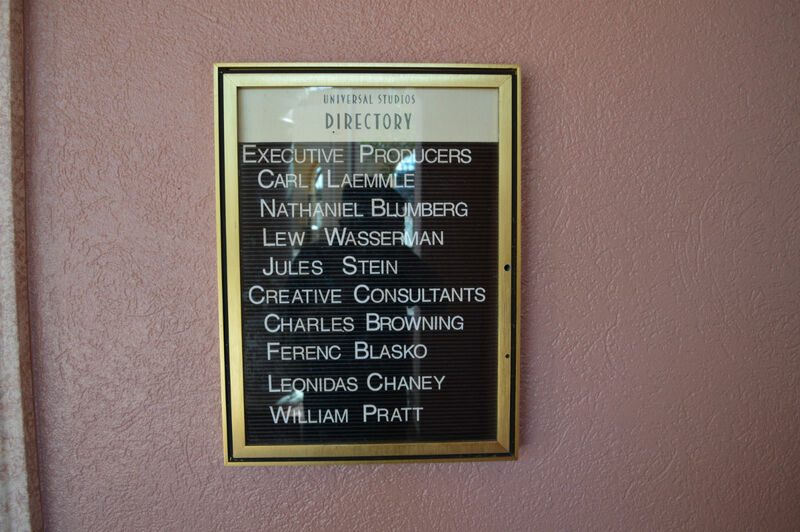 There was an interesting directory outside the main door with some great tributes to the history of Universal including Lew Wasserman (who has a statue in the New York section of the park and was a key figure in getting USF built) and “Leonidas Chaney,” who we know better as Lon Chaney and one of the most iconic horror movie actors of all time. At the check in desk we received a Halloween Horror Nights 23 lanyard and our ticket. I held out on getting a lanyard for years, wondering what the point of them was but I now consider them to be an invaluable asset to touring theme parks. It is sooooooo much easier to let Universal scan the tickets (whether park admission, Express Passes, photo connect card, etc) by just holding up the lanyard than keep getting them out of your pocket. We then went upstairs, where we walked past a couple of themed rooms. Nice little touch. I believe we were actually the last guests to enter the room where everyone was waiting. In the room we were then separated into groups of about 10-12 people, each assigned to a VIP tour guide. Meg would be our guide for the day and she was amazing. Throughout the entire day she talked about the individual houses, the USF park itself, Halloween Horror Nights history, and even the individual intellectual properties themselves (like Walking Dead, The Cabin in the Woods.) If you take a VIP tour at Universal, Unmasking the Horror or otherwise, ask for Meg. 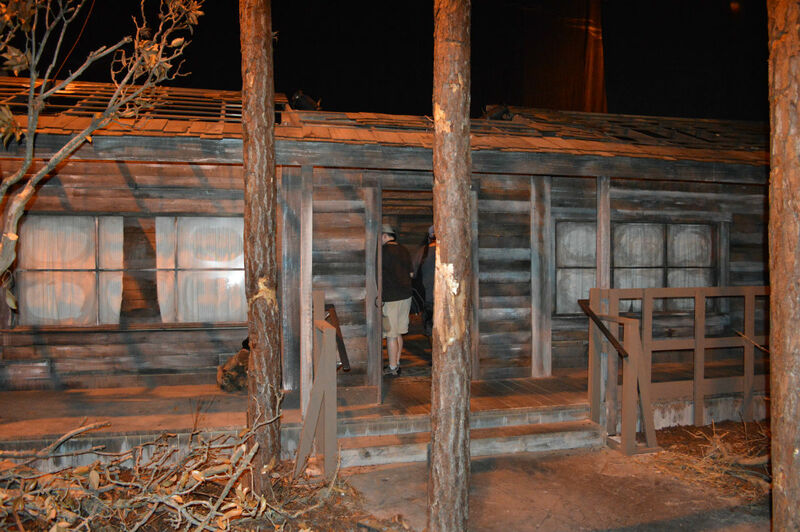 We walked through USF over to our first house of the tour, La Llorona, but along the way we stopped at some of the scare zones including what every Walking Dead fan knows as “Dale’s camper” in the campground section outside of Animal Actors on Location. 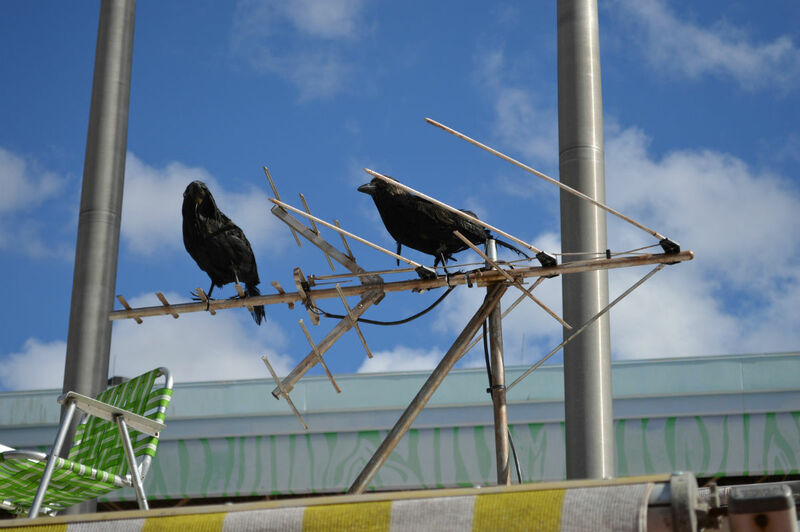 On top of the camper, Meg pointed out the crows and told us to keep an eye out for them throughout the entire HHN experience as they can be considered an Easter Egg that Universal Creative hid throughout the houses and park. Meg talked to us about the various type of agreements Universal has with each of its licenses. For example, in last year’s Walking Dead there absolutely ZERO references to any actual characters on the show. 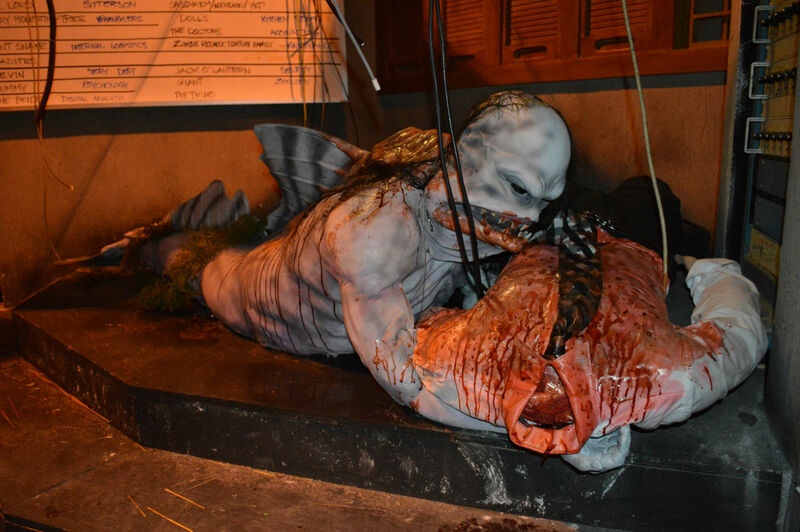 This was very noticeable and one of the (several) reasons I felt the experience in HHN 22 was lacking. This year, thanks in part to Walking Dead executive producer Greg Niotero, Universal could use characters who have been “turned” but not any characters who were still alive. 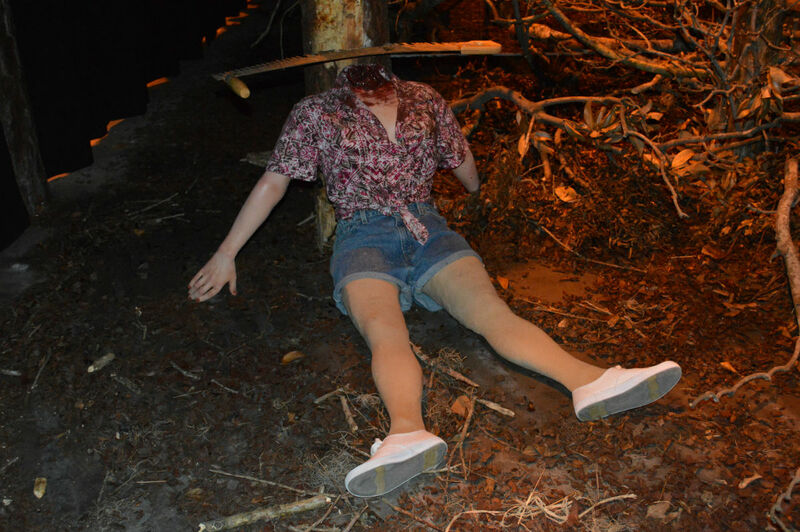 This is why we got to see Michonne’s walkers, the Bicycle Girl, Merle, and the Governor’s daughter Penny (among others) in HHN 23. The addition of actual recognizable characters to the event increased my enjoyment by at least a factor of 10. 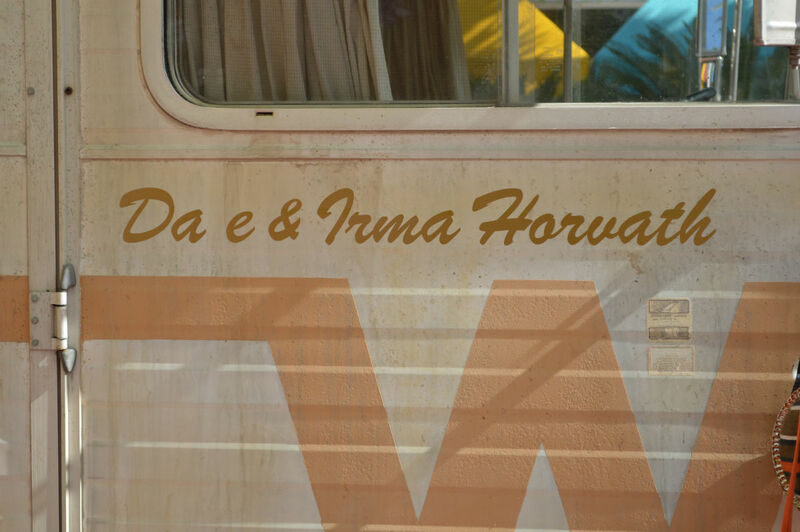 They could also have a little fun by making allusions to other characters, such as this marking on the iconic camper. We walked backstage (no photos allowed in this area of the tour) and approached the La Llorona house. 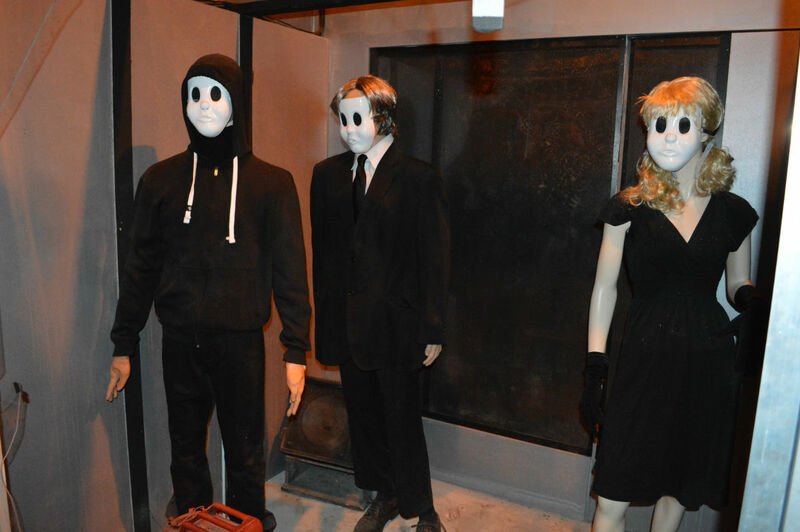 Unlike last year, where this location had the Alice Cooper: Welcome to My Nightmare house, there was a full facade set up that really added to the experience. I loved it. The biggest difference between this representation of a Mexican church and a real one? No wrestling masks for sale outside. 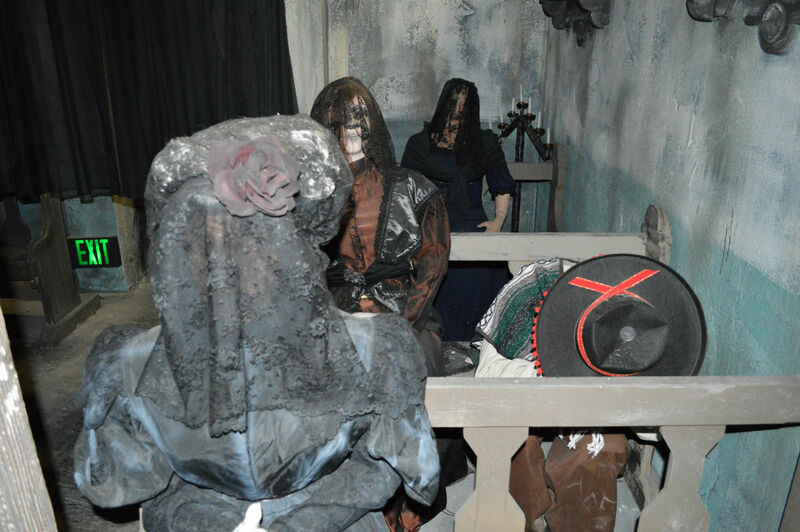 The first “scene” you walk into for La Llorona is a funeral service for dead children. 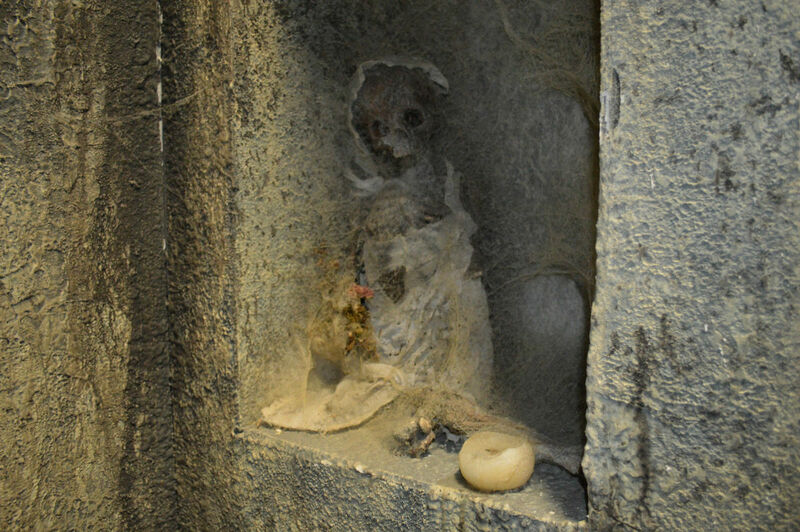 One of the creepiest things I have ever seen at a theme park. The bodies were actually a bit bloated to show the effects of drowning. Great detail. 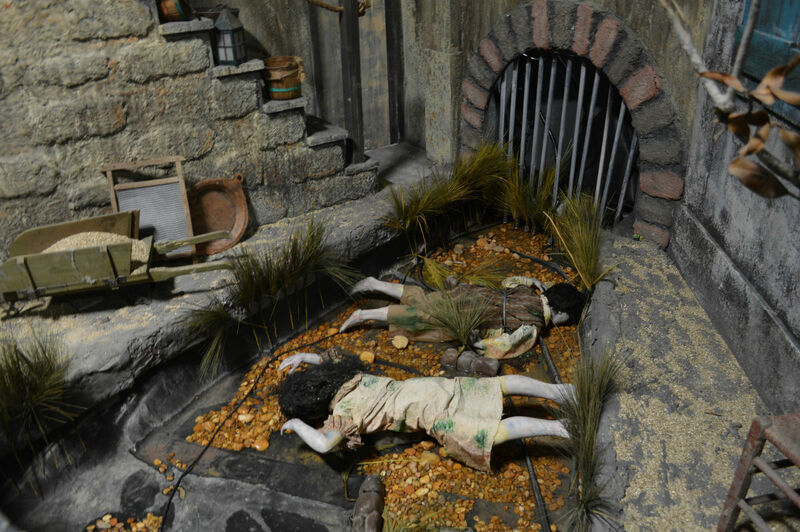 In all the houses, Meg would explain to us where the scare actors would be in scenes and how they would interact with guests. For this particular scene, “grieving” women would rise to shock the people walking through. 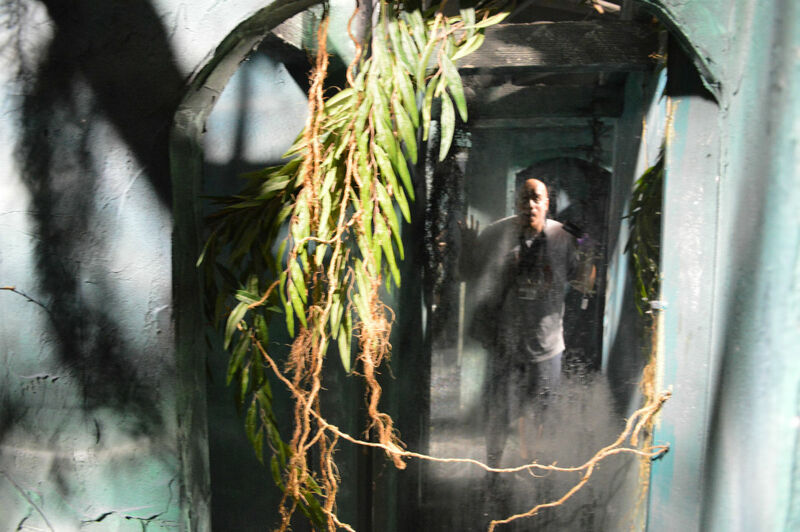 Meg explained that the first half of La Llorona was inspired by the Universal Hollywood version of La Llorona, as they have used the Mexican legend as a haunted house for several of their Halloween Horror Nights. 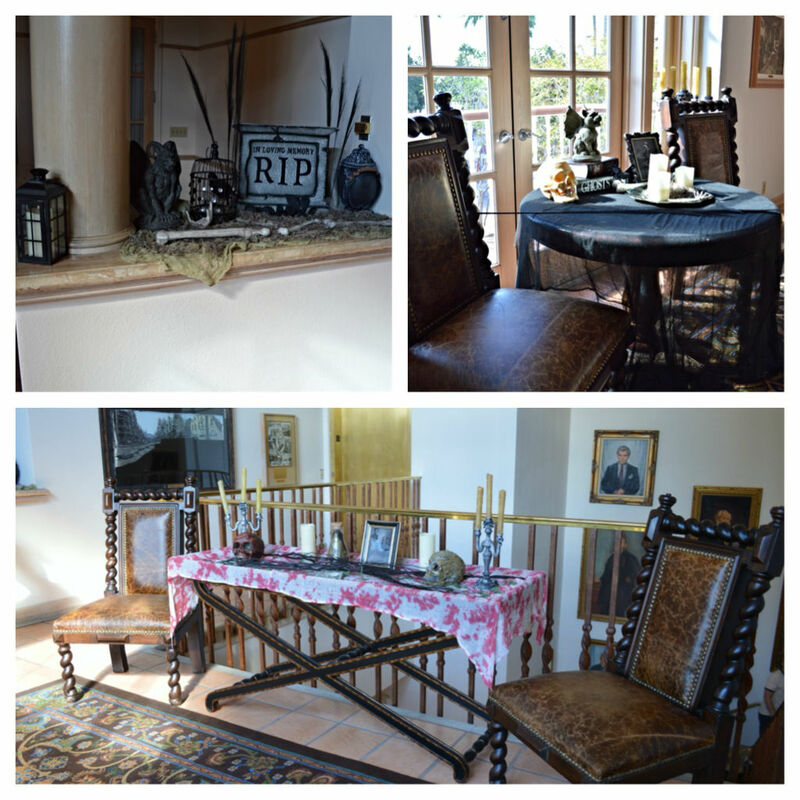 The second half of the house was completely original by Universal Creative in Orlando. During the day this room seems innocuous. At night it is one of the best walk through parts of any of the HHN houses. Chilling and eery. Meg talked about the areas that Scareactors hid in and how they could move around to scare guests multiple times, including using the fabled Pepper’s Ghost effect. 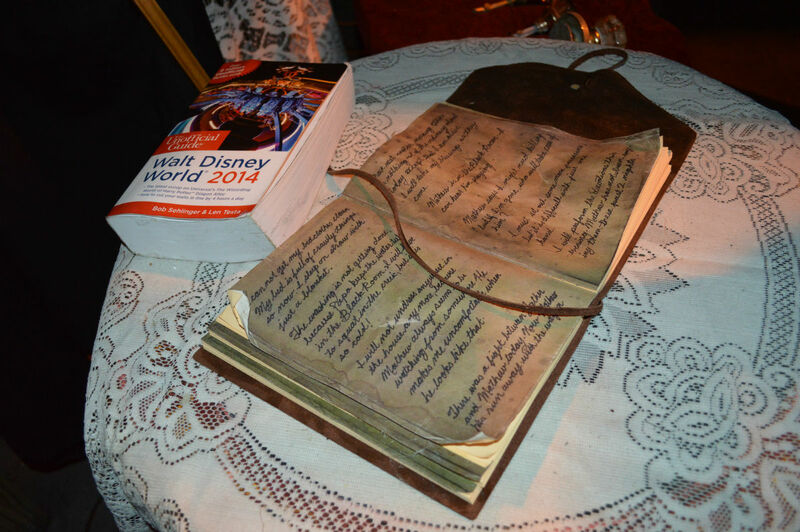 She also showed how Universal subtly guides guests throughout the experience, keeping them out of areas they shouldn’t be in and away from scare actors. Fascinating stuff. Zeus shows us one of the tricks Universal uses to throw people off. The person in front of you is actually about 20 feet to your left. After leaving La Llorona, we continued our walk backstage into the parade building that housed Walking Dead: No Safe Haven. This was a fun walk as we got to have a peek along the way at the infrastructure Universal has behind the scenes to the keep the entire park (and HHN) running. I liked seeing the Mardi Gras floats lying in wait for Feb 8th, 2014 to roll around. Meg talked to us about the entrance to Walking Dead being the only HHN house that had scare actors at the front before you even enter. 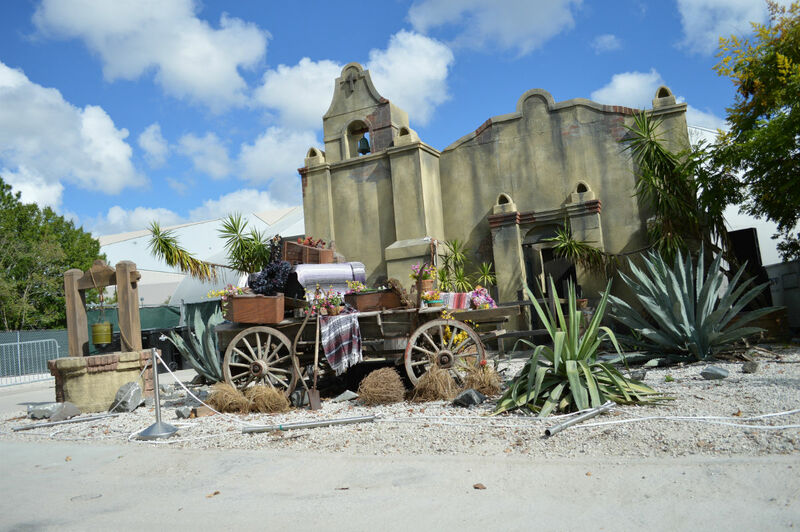 She also explained some of the tricks Universal uses to scare the guests, such as the cage on the right hand side seemingly being complete and guests feeling confident that they can taunt the “walker” inside, only to find out one of the walls is missing. The facade itself was representing The Arena from the town of Woodbury. 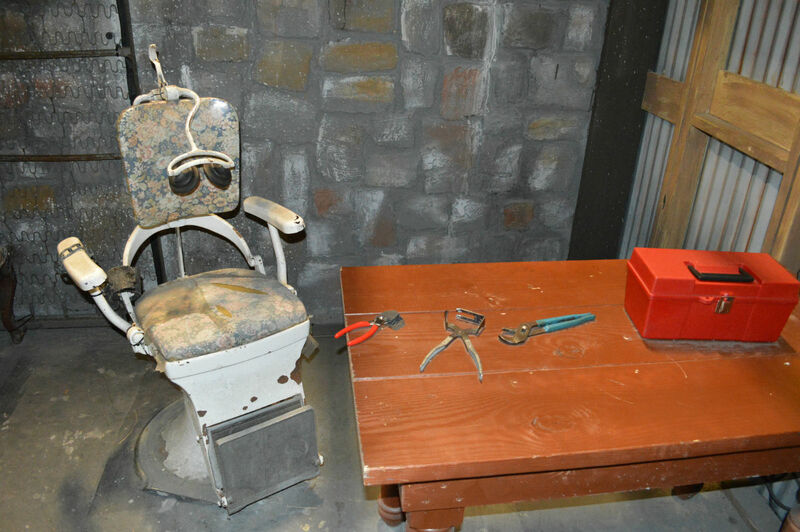 The first room we got to see was the interrogation area, which was followed by a room that had a great homage to the scene from Season 3 in which Glenn was trapped in a room with a walker and killed it with a piece of wood from a chair. 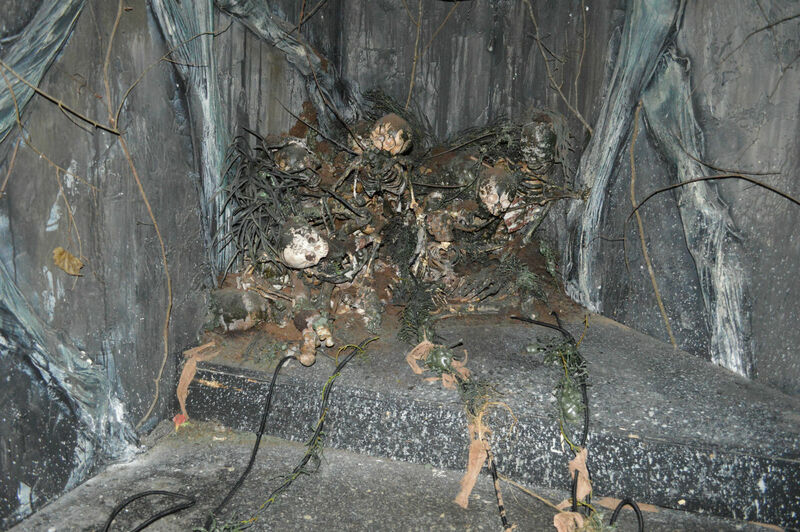 Walking through HHN at night we got to see the AWESOME effect of the Governor’s collections of heads in the fish tanks. Meg explained how Universal got to have the heads floating in water, but also so that the faces actually looked out at the guests instead of moving all around. They used little suction cups. 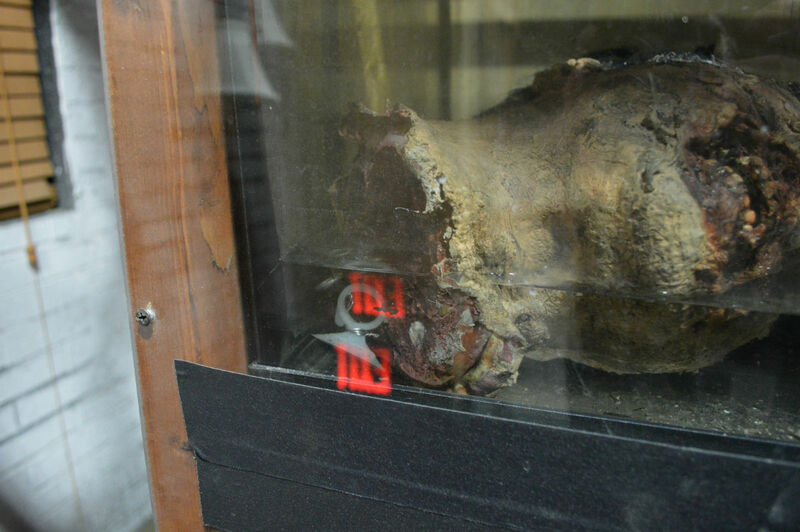 Head from one of the Governor’s collection. If you look at bottom left you’ll see the suction cup that keeps it floating in the correct position. 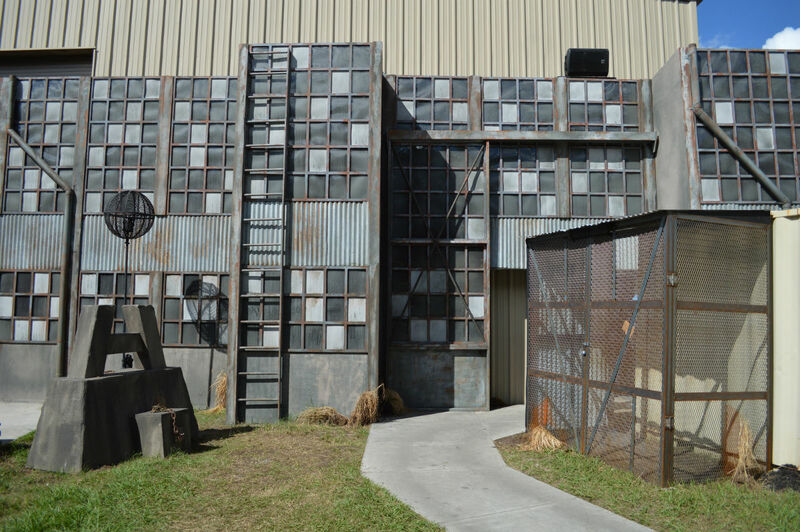 The prison area of the Walking Dead house was a lot of fun. 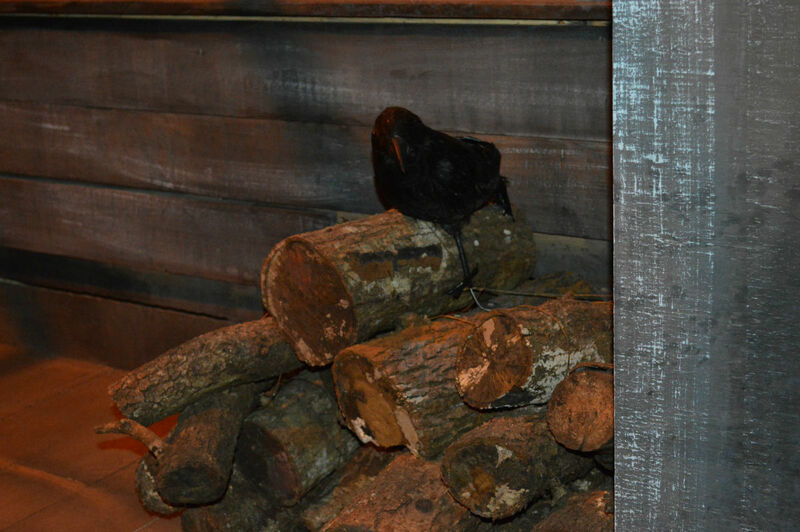 Throughout the tour Meg explained to us the social dynamics of HHN and how guests just love to touch stuff. 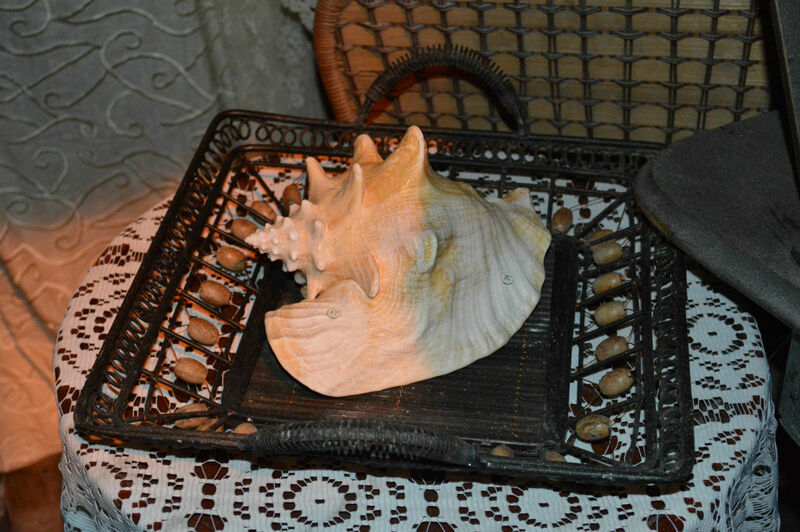 Most items need to be nailed down, but one prop is actually used to trigger an effect. 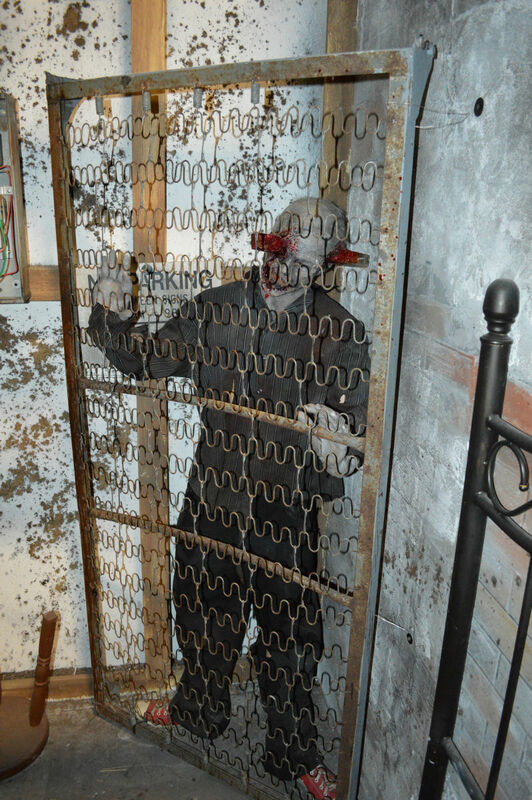 While in almost all cases the scare actor themselves have hidden cues they use to set up effects, one room has the rotary phone that Rick used in the Walking Dead. 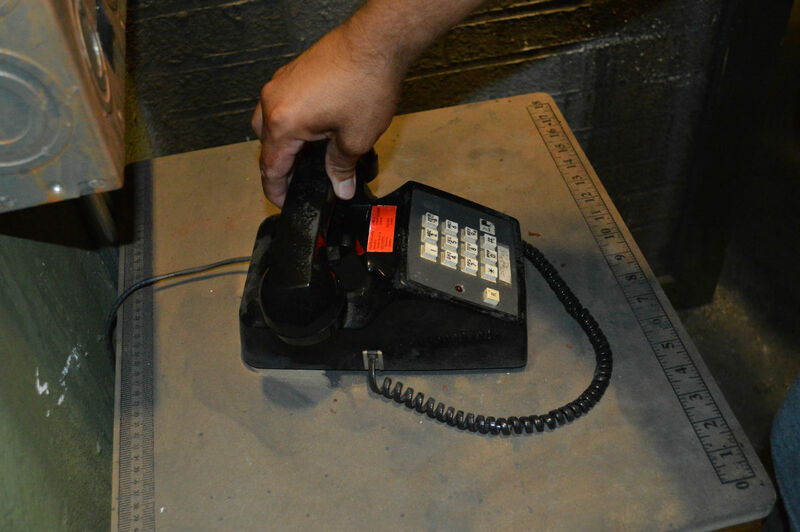 When a guest picks up the receiver of the phone, it sets off an audio cue of Lori talking to you. 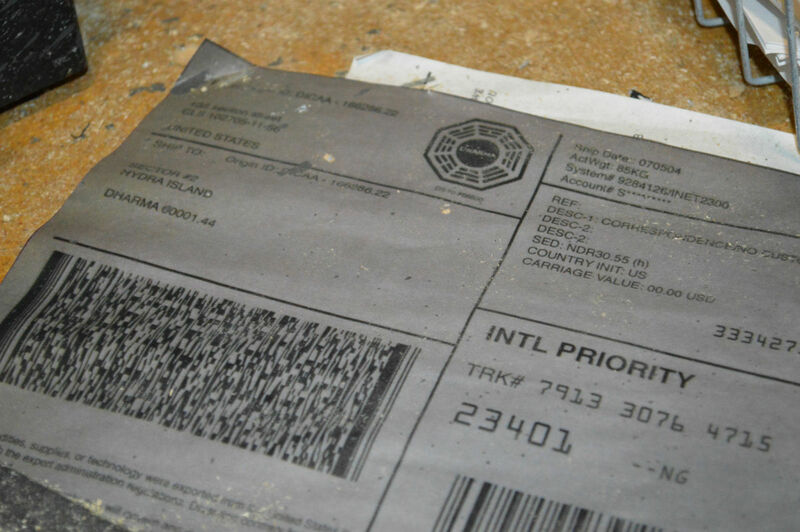 LOST fans should recognize the Dharma Initiative logo. 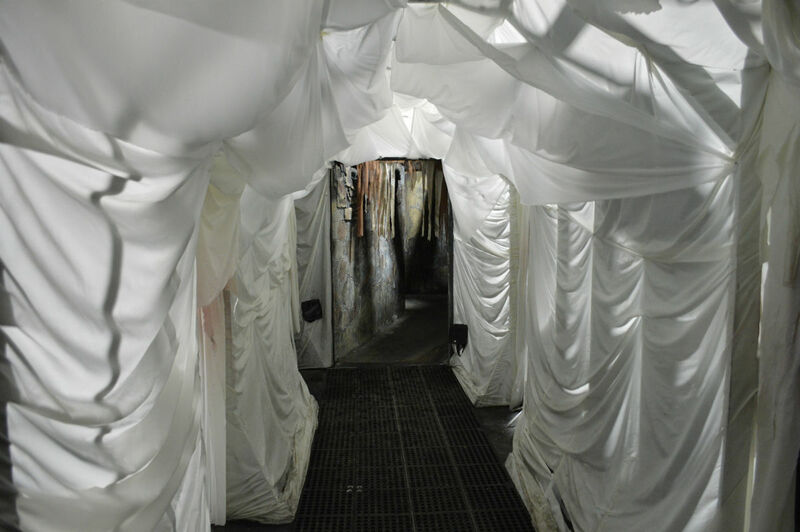 While finishing up the house in the cell block of the prison, Meg explained that the Walking Dead house needed to be able to get 2000 people per hour through the experience and what the Universal team members do – again, in subtle ways – to keep guests moving throughout the experience. We got a lot of great intel on the work it takes to keep guests constantly moving but not making them feel like they are being rushed through. Nice nod to a character who had to have his leg cut off in Season 3 of The Walking Dead. After Walking Dead, we walked back to the front of the park to visit our last house of the morning tour, The Cabin in the Woods. This was the house I was looking forward to seeing the most because it was my favorite movie of the ones used for the event (secret shame: I have yet to watch An American Werewolf in London) and it was my favorite house walking through the actual HHN experience at night. For wrestling fans, this was one of the houses used in Soundstage 21, the former (and future?) home to TNA’s Impact Zone. 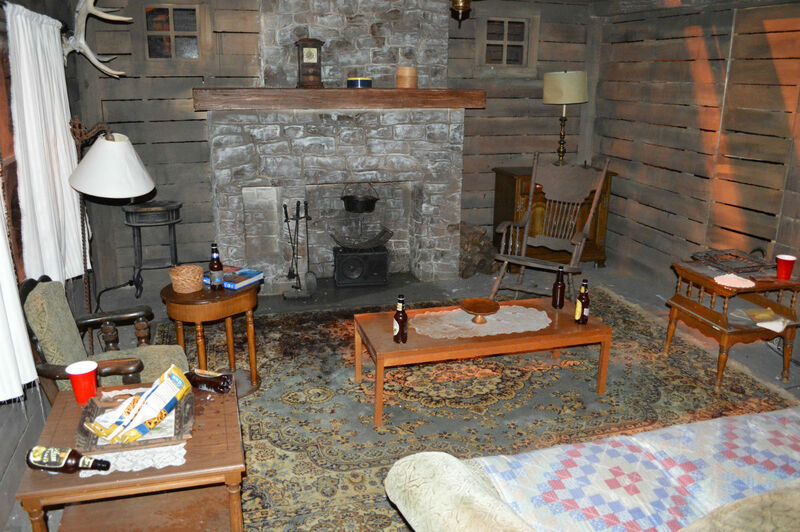 The first room of the house is a recreation of the main room and kitchen of the cabin in which the kids spent time in. 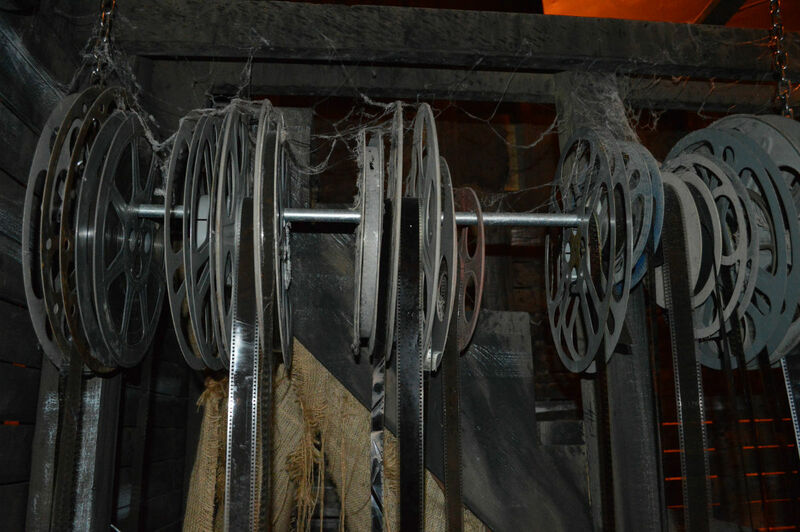 Meg talked to us about Universal taping up screen shots from the films licensed for HHN and tape them up all over the house to try to get as close to movie-acurate as they can. 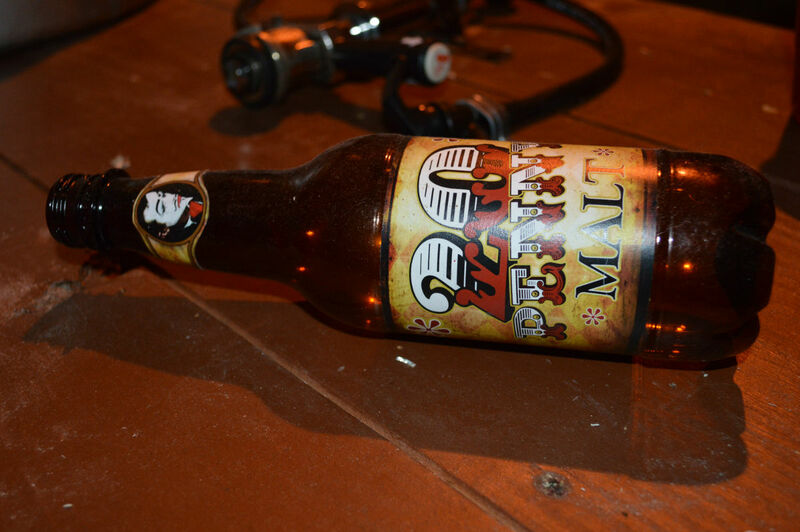 One of my absolute FAVORITE things that I only knew about because of the tour was Universal Creative making 20 Penny Circus beer bottles as set decoration. 20 Penny Circus was an act that played at HHN 22 in 2012, and one that I really enjoyed. This is why we can’t have nice stuff. We ruin things for no reason. Right, painting of Tony Baxter? 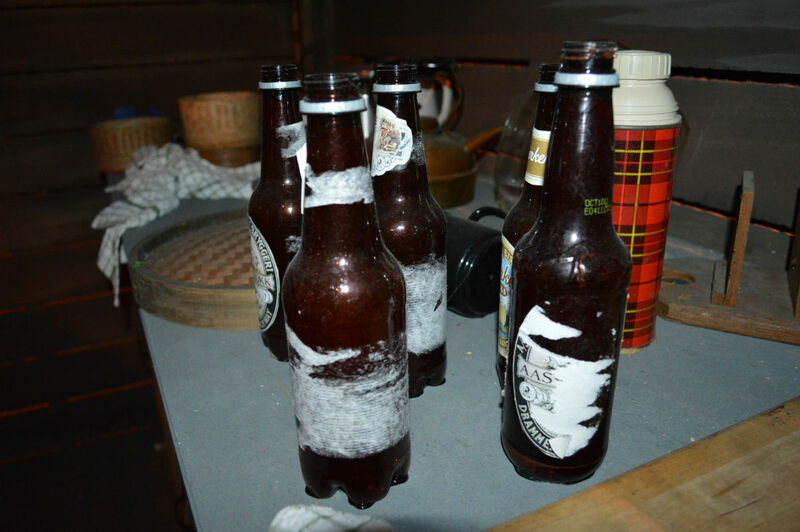 We were led through several rooms of the cabin, but down in the basement is where business really picked up. 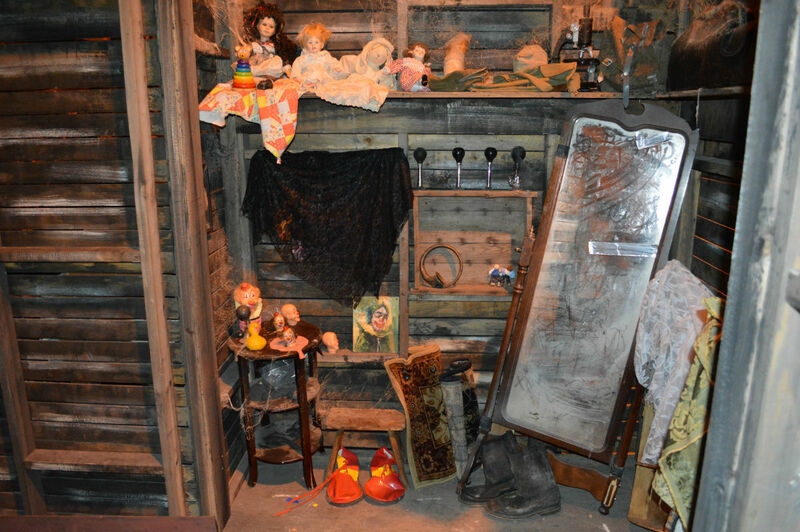 This was the room which had all the items in the which the characters in the movie would use to trigger a particular horror archetype to come kill them. 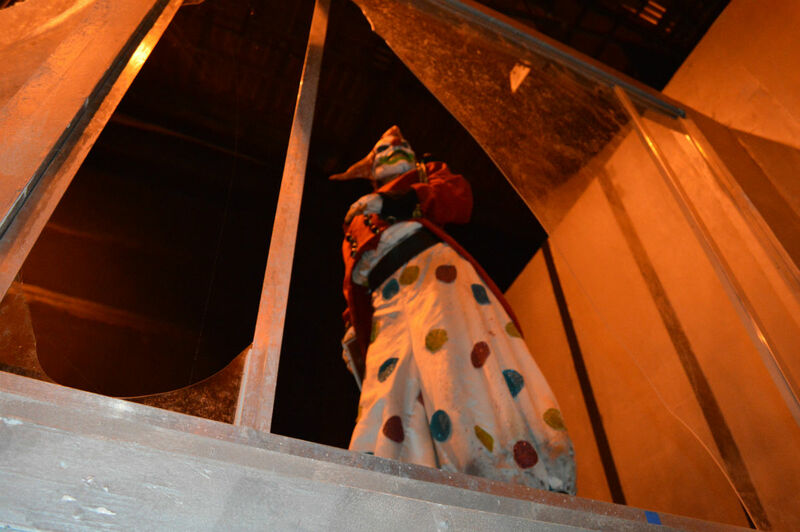 We eventually made our way to the elevator scene, which was pound for pound my favorite scene of any house in HHN 23 when I toured the event at night. An awesome experience. 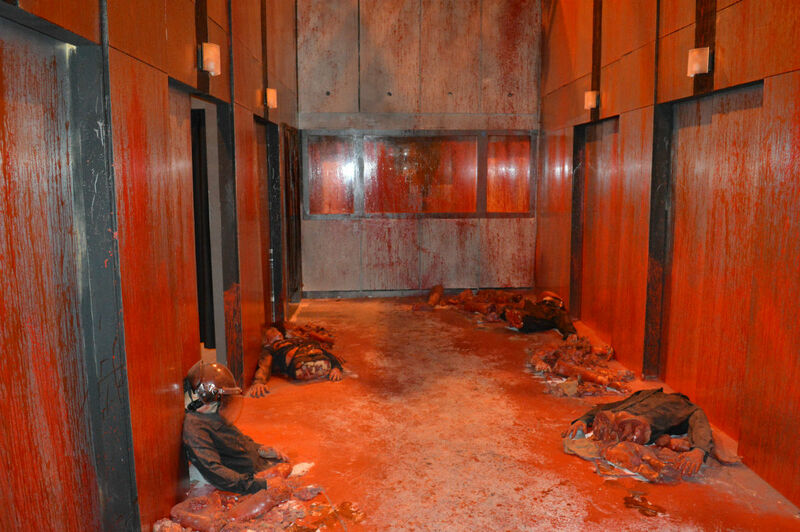 The elevator room is pretty damn creepy during the day as well. Most houses at HHN use about 7 gallons of blood. The Cabin in the Woods used 15! 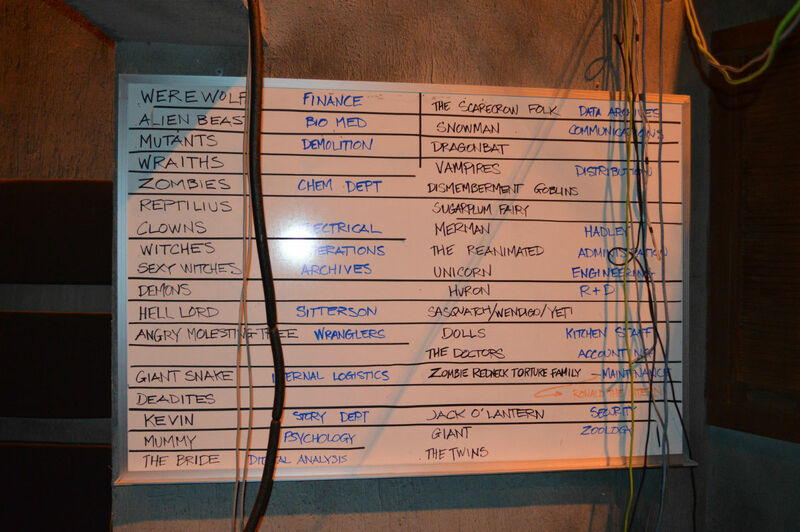 The Big Board. So many shout outs to classic horror movies. 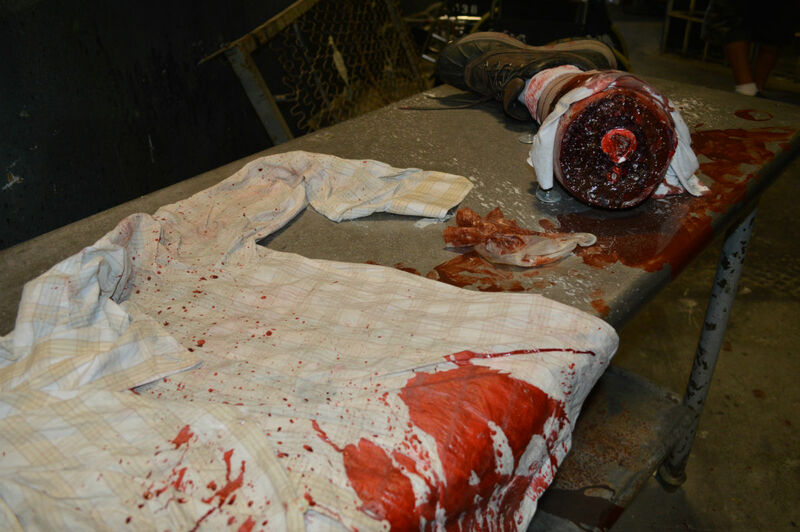 The carnage continues for several more rooms with some great looks at characters including Jack Schmidt, one of the iconic Halloween Horror Nights characters created by Universal. That was it for the first half of our tour. It lasted about 2 hours and 15 min. We were allowed to take as many pictures as we wanted but no video was allowed. An absolutely insanely awesome experience and I already knew I’d be doing Unmasking the Horror tours every year from this point on. The group split up for lunch and would meet back by the Barnyard Hot Dog food station by the Twister attraction at 2:00PM to continue with Afternoon Abominations where we would tour Resident Evil: Escape From Raccoon City, Evil Dead, and most people’s favorite HHN house of all time, An American Werewolf in London. To Be Continued…. Hollywood Rip Ride Rockit: Hidden Tracks Offer Even More Reasons to Ride Again!